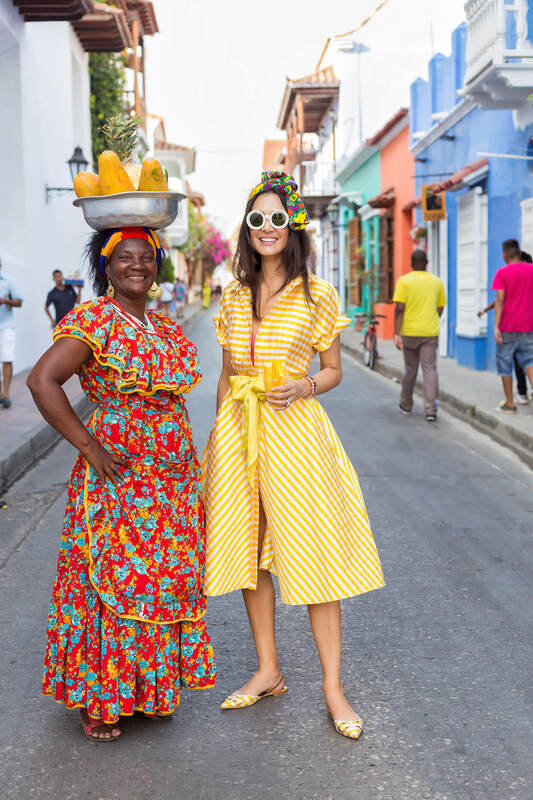 I was walking the streets of Cartagena in my yellow mellow outfit from Carolina Herrera. 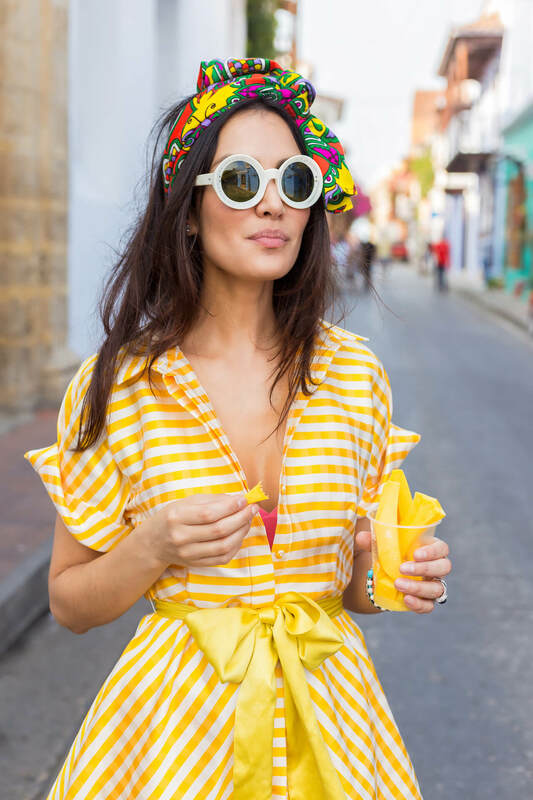 I wanted this post to be, one of my spanglish post as I am in Cartagena and would like to mix it up. I loved eating my mango biche and speaking with this cute palenquera, Julia! La Vitrola : La Vitrola translates into jukebox in English which is a place for friends and family to chill and soak in the vibrant Cuban culture. I love this restaurant, here is where I celebrated the dinner before my wedding with family and friends. Mojito’s are amazing and the live band. Don Juan: El robalo y hummus de remolacha, ravoli de setas, tiradito de salmon, bolitas de guineo es un must mientras estás en el Caribe. It’s a fun and trendy spot. Harry’s (Hotel Santa Teresa): I love the beautiful patio it makes a perfect scenery to have lunch or dinner. You must order the nachos with crab, mero curado con limon and the Limonada de Coco. It’s a kid friendly place so it’s nice to go with my family. Carmen: If you love floor images this is a must place to visit, the tiles are super cute. An appetizer you have to order are the Carimañolas. La pesca del día it’s a must pargo platero y el postre de fresas con crema are a classic, there has been times I only go for that dessert. Juan Del Mar : Uno de los íconos de la Plaza de San Diego. Lindo para sentarse en la plaza y tomarse un trago. You should go inside to take some Instagramable images. El Baron: It’s a cozy and cool place with a liquor bar. Drinks para tardear ubicado en la Plaza de San Pedro Claver. Colette: is a classic french bistro located in beautiful Plaza San Pedro Claver. Mistura: Este restaurante empezó en mi ciudad, Medellín y ahora esta localizado también en Cartagena en la ciudad vieja. Club de Pesca: This is an icon of Cartagena and the best place to watch the sunset. La bahía es muy linda para ver el atardecer. La Havana: favorite place to dance some salsa. I make sure I party here every time I come. La Jugada: If you wanna enjoy Colombian music with nice people from the area, this is the place! Bazurto Social Club: a bailar champeta, reggae se dijo. It’s a fun place to have drinks and learn different steps. Agua de Leon: in the heart of the historic center, is made up of colombian designers and has an enchanting bar. There you can get my sister accessories. 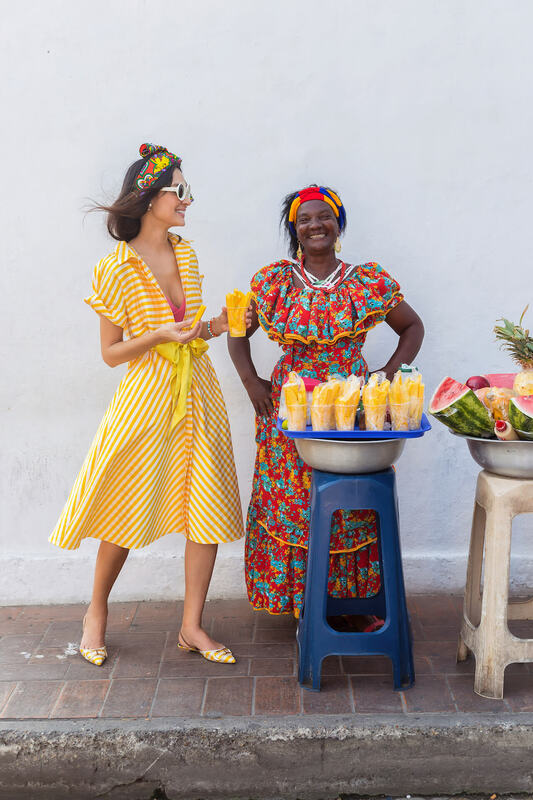 St Dom: features high-end Colombian designers with fashion-forward creations, from Johanna Ortiz clothing, Entreaguas beachwear, to Ballen Pellettiere handbags. Casa Chiqui: it is located in a 1930s warehouse restored by Chiqui herself and has become one of my favorite destination. 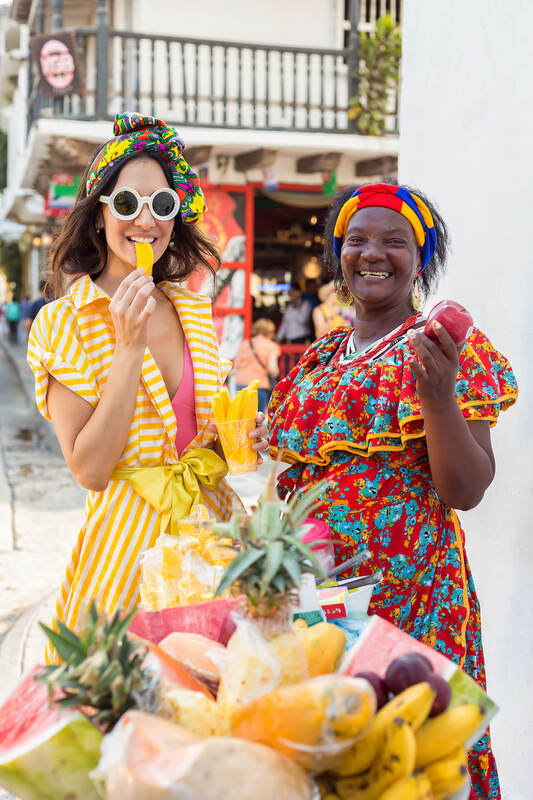 It has magical finds when strolling around Cartagena, it’s a must stop. Maygel Coronel: it’s a beautiful newly opened boutique with many talented Colombian designs. Territorio: it’s a cute shop to buy artesanal work, I love to get beaded bracelets that makes perfect gifts for my friends at home. Un lugar fantástico para comprar artesanías.